Anyone can show up just to watch the mayhem! Here's how it works: The titles of that evening's play submissions are placed in one jar, and the names of willing actors in another. Plays and actors are then selected at random to perform the piece. The writers are given a few moments to prep their team, and then... the play is performed, scripts in hand. A total of ten plays will be performed, and with a 20 minute intermission the match will last around two hours or so. The fun is very real and the action is totally unpredicable! This event is for adults age 18+ ONLY, as the content can be of an adult nature. Doors open at 6:30p. Match begins at 7:30p. Cash bar is available. There is NO admission or submission fee. Donations happily accepted! 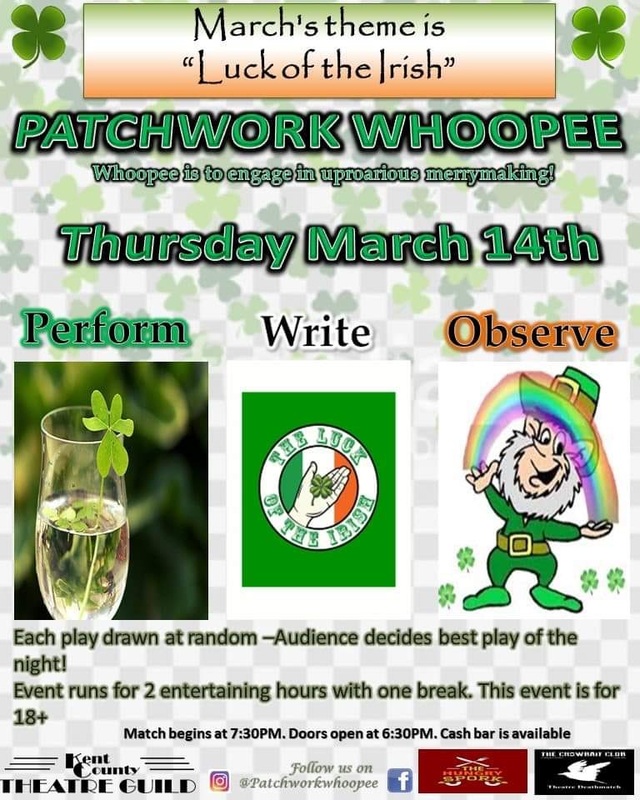 The idea and format for KCTG's Patchwork Whoopee is taken (with their kind permission) from Portland, Maine's The Crowbait Club. Their monthly "Theatre Deathmatch" event has proved wildly popular...and the movement is spreading!